Delivery time: Category 4: This item is handmade to order! Europe & UK: 14-19 BD, USA: 16-23 BD, CA/ AU/ NZ: 18-25 BD, BD= business days, dates only apply if you pay promptly with your order. Your country is not listed? Just ask! Hair fall, volume size L with straight hair! 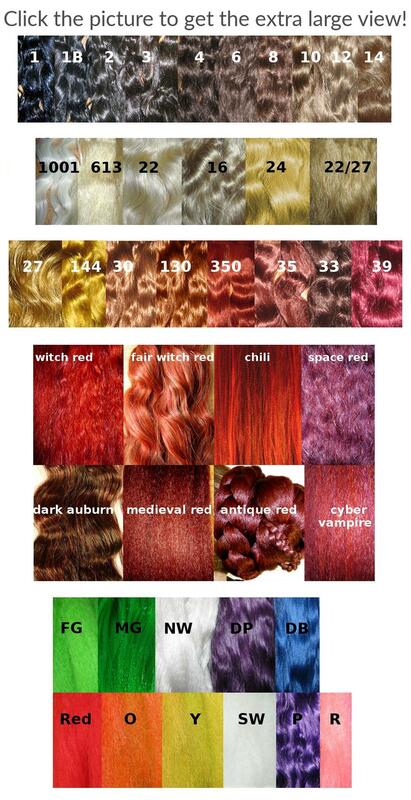 Made to order and custom-matched to your hair color. Hair pieces with straight hair have much less volume than our other hair textures. 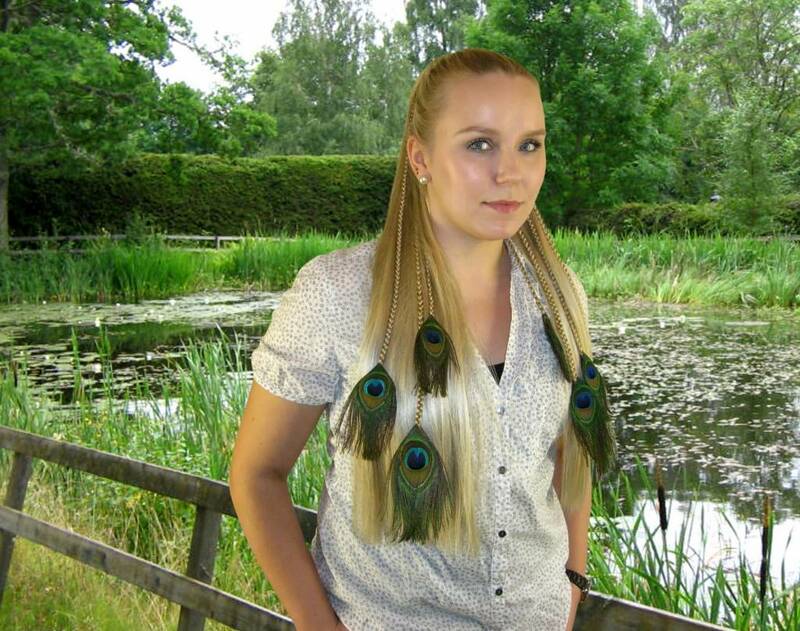 If you want more volume, have a look at our wavy hair falls! As your own hair is pulled back into a ponytail to attach the hair fall, you can wear a wavy hair piece with your own straight hair. It will still look natural, because one cannot tell from your pulled back hair, that is it not wavy but straight. 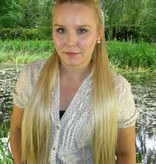 Straight hair falls are not good for updos and braids, because the hair does not have enough volume. These are for wearing open only. 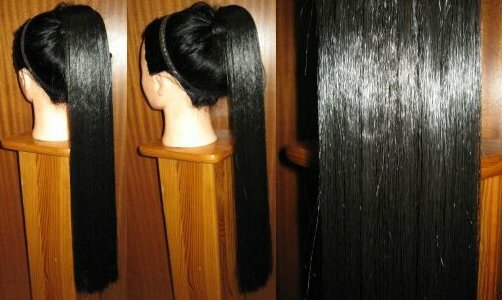 This hair piece is about 55 cm/ 22 inches long. Please understand that this personalized item is made to order especially for you and cannot be returned! Read all details in our general terms and conditions. 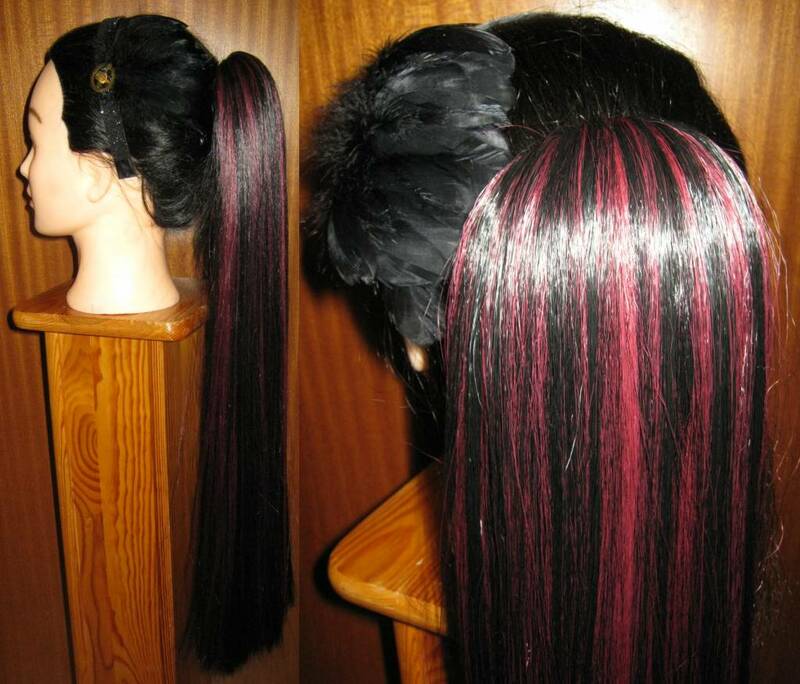 Some product pictures show how to combine this hair piece with other hair jewelry, clip-in hair pieces etc.. These items must be purchased extra. We only use Kanekalon hair - best quality in synthetic hair! 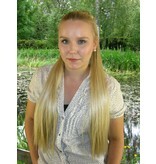 Kanekalon hair has a real touch feeling, a natural shine and is very carefree. 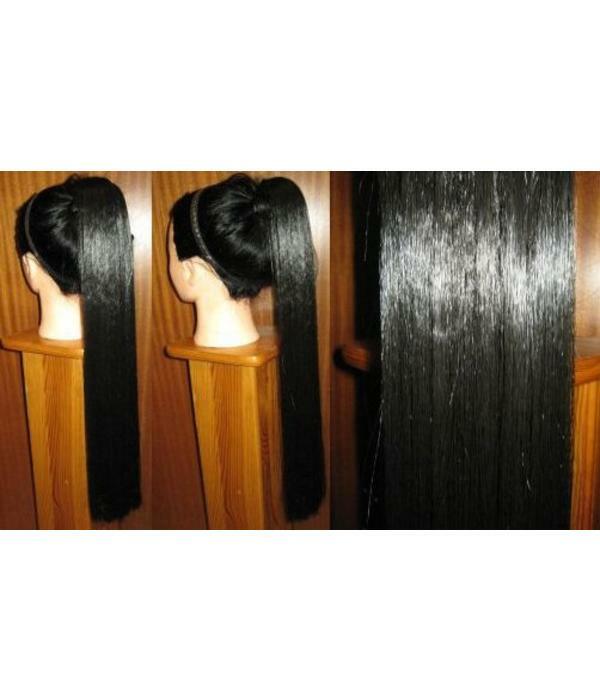 All hair pieces are delivered with detailed instructions for attachment, use and care. 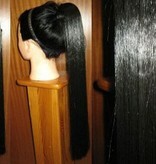 You can choose the basic attachment, if your hair is longer than shoulder long and if you don't have fine/ thin hair. 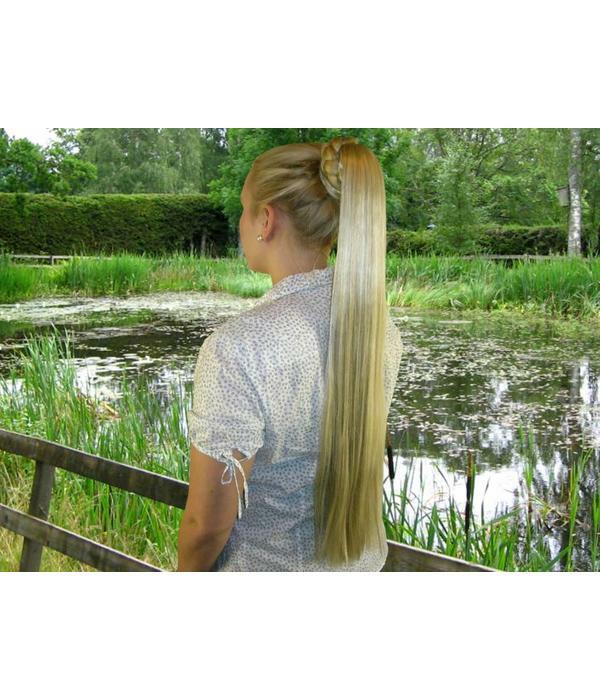 Still the fishtail attachment is never too much, you can add it for any hair length! 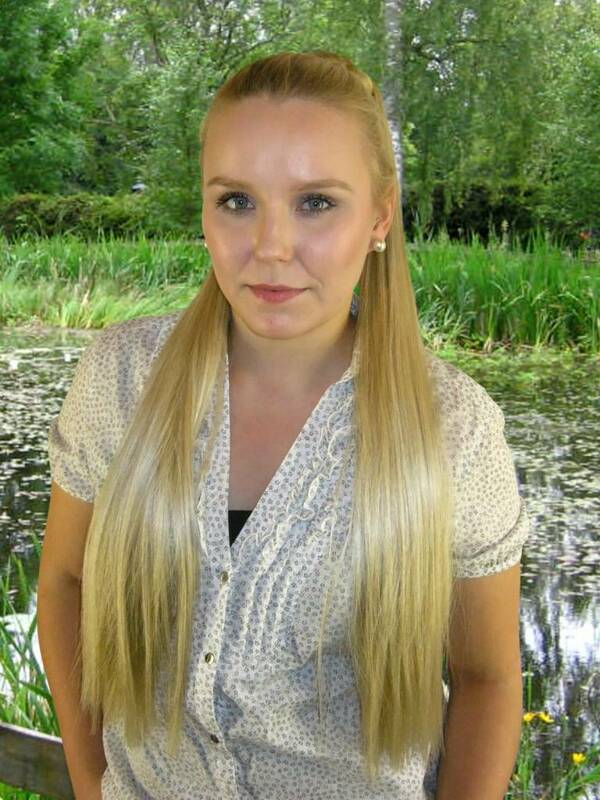 The hair fall is pulled over your own ponytail. 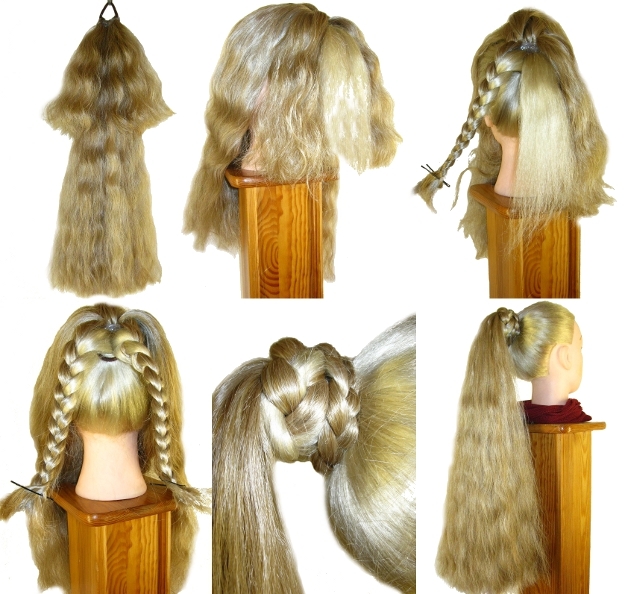 Your own hair is used to counter-secure the hair fall by being wrapped around the attachment and being secured with hair pins (see first row with braid). 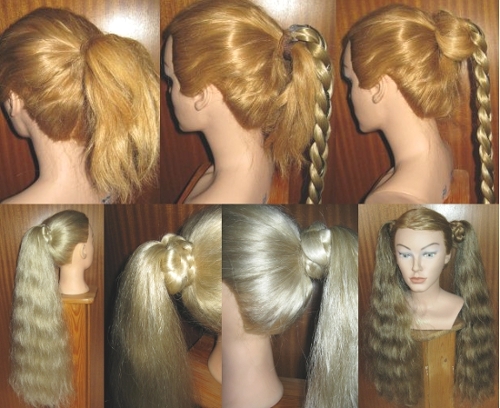 You can also braid your hair before wrapping it around (see second row with open hair falls). 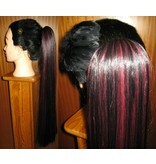 This makes an even nicer finish and it is easier to secure and less stressful for your own hair. 2. Professional Fishtail Attachment = strong hair tie and two additional strands of hair which complement your own hair so you have more to wrap around the attachment. 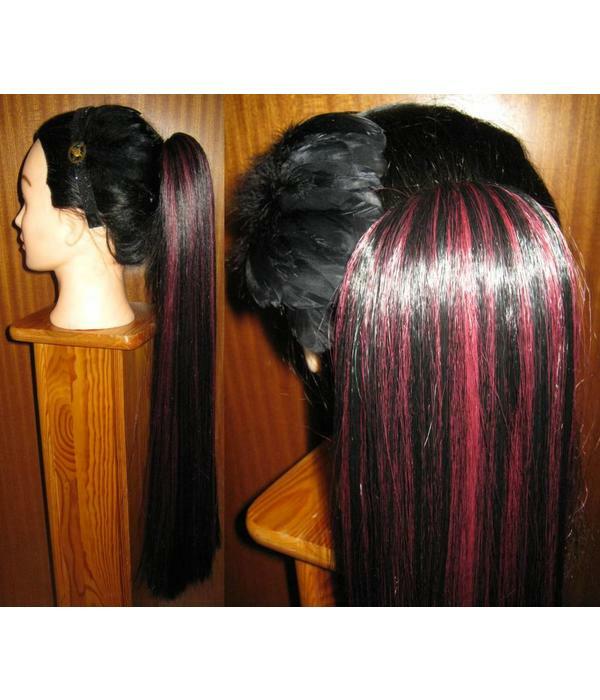 2nd to cover the junction of your own hair and the synthetic hair! 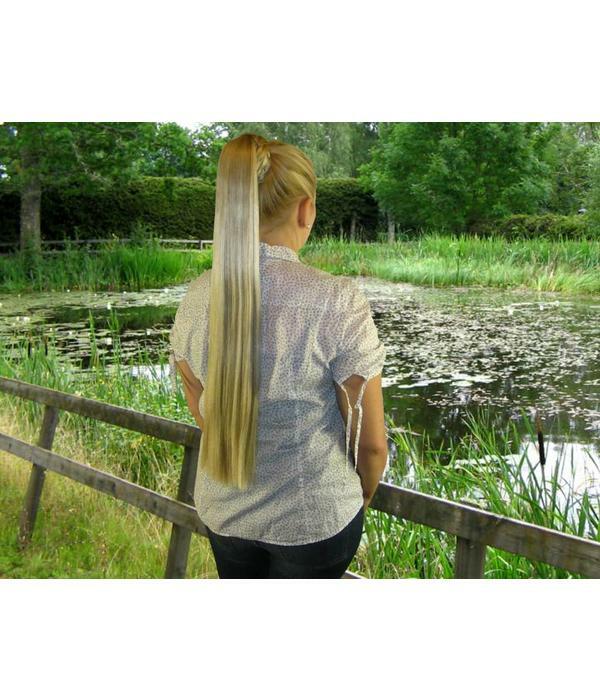 The direct fusion of your own hair and the additional hair of the fishtail attachment offers maximum hold and is the most natural looking way to attach a hair piece! This fishtail attachment upgrade provides extra strong hold (i.e. needed for acting and dancing) and most customers find it more comfortable to wear and easier to handle than the basic attachment. I named it fishtail attachment, because the two extra strands reminded me of the shape of a fishtail when I created this attachment method. 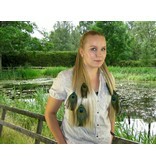 The fishtail attachment is highly recommended when you have thin/ fine hair or hair shorter than shoulder long. As it is never too much, you can even add it, if your hair is shoulder long or longer, of course. It is also nice to have, if you like the small buns which occur when the fishtail attachment is used. Click here if you wish to see some more styling variants with professional fishtail attachment! 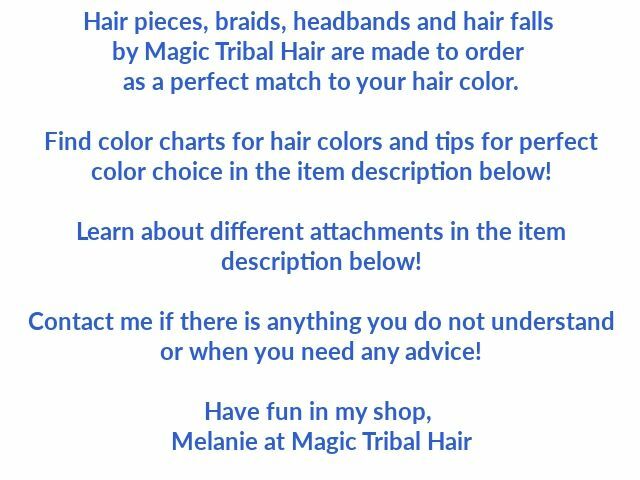 Your hair color can be matched perfectly including highlights, lowlights and all shades, because all braided headbands are made to order exclusively! 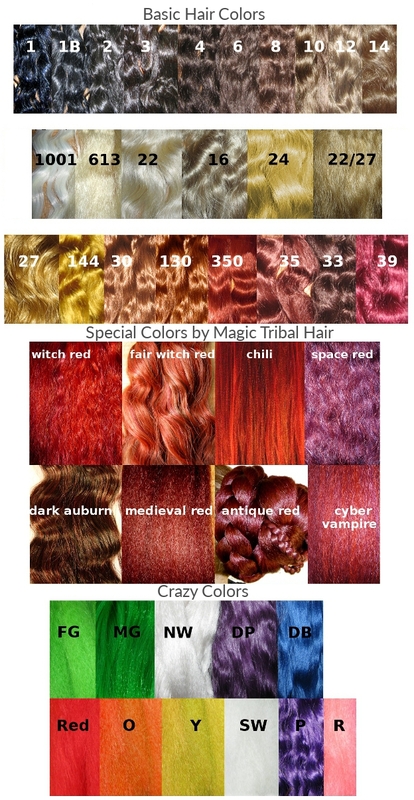 One's own hair usually contains 2-3 colors (only dark hair often consists of 1 color only), hence we include up to 3 colors in the price. Click here for extra large color charts! Click here for more information about choosing the right color mix! The price includes a custom mix of up to 3 basic colors, a fourth or fifth color can be added at extra costs. Some special colors also cost extra, you will see this in the menu. 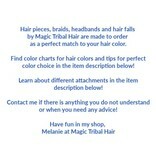 1st menu HAIR COLOR, choose your colors or enter "advice needed". 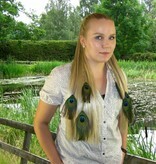 Press Ctrl and click all the colors you wish to choose for your hair piece. If you need more than 3 colors, choose the upgrades 4th or 4th and 5th color from the drop down menu, so the extra fees are added. If you forget this, we will send you a manual invoice for the extra fees and delivery will be delayed, because we can only start making your hair piece after this second invoice has been paid. Option: If you want to make your purchase, but still need our support in choosing the best color match, choose "Advice needed!" instead. In this case delivery time cannot be met, because we can only start making your order when all information is complete. If extra costs because of a 4th or 5th color or special colors occur, we will send you a manual invoice and delivery time will only start after payment for this second invoice has been effected. 2nd box for optional color proportions "Insert proportions for colors if desired here"
If you wish more of one color and less of another use the little message box to insert desired proportions (e.g. 2/3 of color 8 and 1/3 of color 30). When you leave this box free, we will use equal proportions of all colors. 3rd menu "details for color mix"
Tick one of the checkboxes. If you wish several colors in a fine blend and one to be added as highlights, use the message box for proportions to tell us which one the hightlight color is. 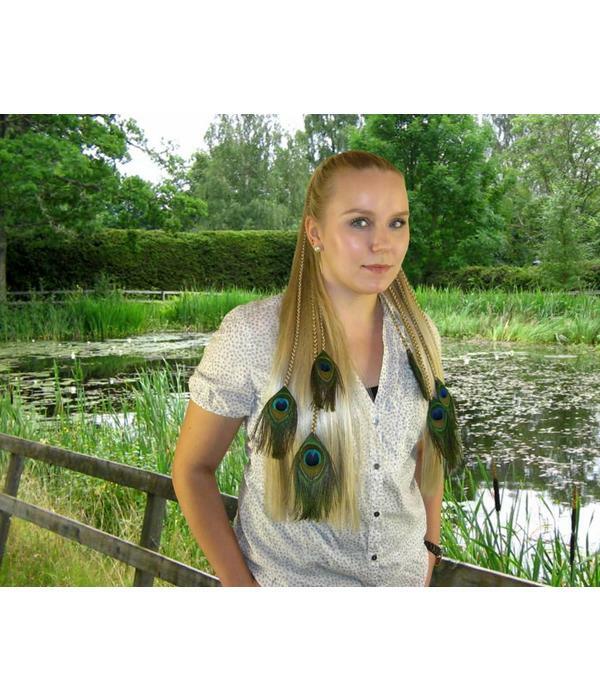 Put the hair piece in your cart to safe your choice! Do you need any help? 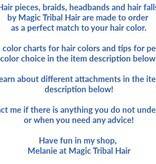 Feel free to send us a picture of your hair and we will give advice! Naturall you can also order color matches to check color details yourself. Click here for all information about appropriate pictures and sample orders! 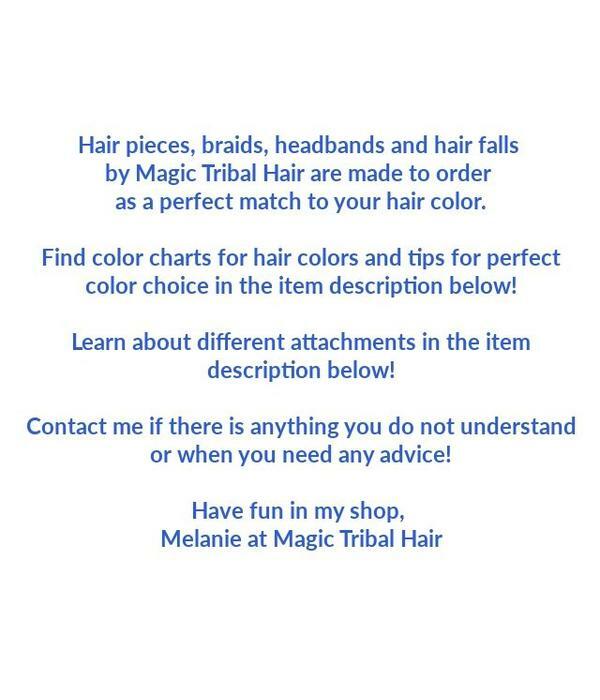 Please contact us for any questions about our custom color hair falls and hair pieces!